The 1970's were an interesting time – CHIPs, Wonder Woman, Charlie's Angels on TV, and music turned electronic on the air waves with the synthesizer playing a big role. Synthetics also emerged in bodybuilding and the muscle measurements went through the roof. Bodybuilders became noticeably bigger, thanks to the impact that steroids had on the culture. It was during the 70's that steroid use went mainstream, and this had a huge impact on the sport. What was largely experimental in the 1960's became part of the landscape in the 1970's. Arnold had arrived on the international scene in the late 60's and the impact that he and Sergio had on bodybuilding turned it toward mass muscle size, which really picked up in the 70's. Just as the amplifier changed rock and roll, giving it an outsized, massive sound, so too did steroids act as an amplifier for muscle, making it massive and stretching boundaries big time. The sudden burnt toward mass did not, however, obliterate the aesthetic side of the sport. At least not yet. The lean lines were still favored. And a small backlash against steroids ensued, and the first natural bodybuilding organizations and competitions arose as well in the 1970's. The training style of the 70's was typically centered around the split training system, with a good deal of volume work. There were some outliers – Vince Gironda's total aesthetic approach still pulled some weight, Frank Zane had an impact, but for the most part people followed the training style of the emerging icon, Arnold (a.k.a. he who needs no last name) and started employing his split training approach for volume. One of the extreme outliers of the 70's was rising star Mike Mentzer, a HIT advocate with an outstanding physique. The muscle mags started having a big influence on bodybuilding as well, with Weider, Dan Lurie, Perry Rader (Iron Man) and the York group (Mucular Development) all gaining in popularity and a new magazine out of Canada, Robert Kennedy's Muscle Mag, also becoming quite popular. The principle organization was Weider's IFBB which held off smaller challengers and remained the most influential organization, especially since he controlled the Mr. Olympia production. Supplements in the 70's were fairly basic, with everything from MLO to Weider's various offerings. Gironda advocated liver supplements and was one of the first to suggest taking glandulars. Research into the science of muscle building started to emerge in the 70's as well but was very elementary compared to today's massive amounts of research output. 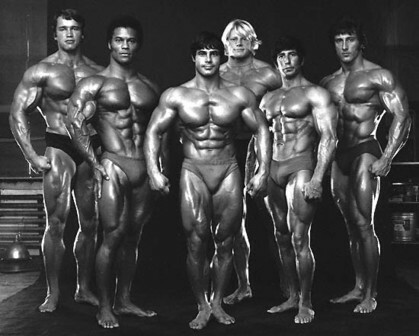 The 70's were an interesting bridge to the mass culture of today and the time when several unique elements of bodybuilding began.